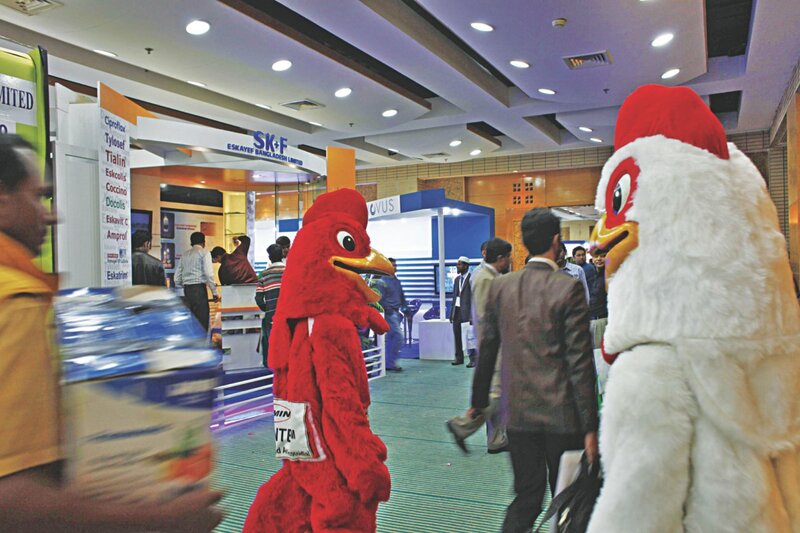 A partial view of the ninth International Poultry Show and Seminar 2015 that began at Bangabandhu International Conference Centre in Dhaka yesterday. Bangladesh’s poultry industry is expected to grow by an average of 16 percent a year for the next five years, banking on higher investment and increased consumption of protein, poultry entrepreneurs said. Total investment in the poultry sector is likely to double to Tk 50,000 crore by 2020, which will take the sector’s total employment, including direct and indirect, to one crore from 70 lakh at present, they added. Khaled was speaking at the inauguration of the 9th International Poultry Show and Seminar 2015, organised by World’s Poultry Science Association-Bangladesh Branch (WPSA-BB) at Bangabandhu International Conference Centre in Dhaka. 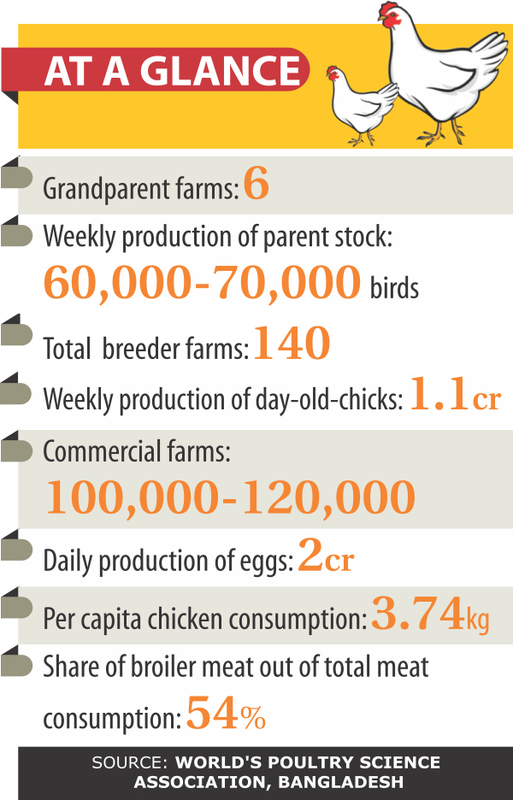 The poultry industry is incurring losses worth around Tk 18.28 crore a day on average, as ongoing violence has disrupted the sector’s tight supply chain, industry insiders said recently. The industry’s total losses would be around Tk 4,500 crore, if all the shutdowns and blockades in the last 15 months are taken into account, they added. Moreover, the sector’s 16 percent growth a year will largely depend on a number of issues like political stability, access to low-cost loans, a supportive government policy, and proper marketing infrastructure, they said. In commercial broiler marketing, retailers now get 46 percent of total profit on average, while farmers’ share is 26 percent, and wholesalers get 28 percent, Khaled said. At the event, Matia Chowdhury, agriculture minister, urged local poultry entrepreneurs to increase protein production to meet local demand and explore export options. Bangladesh used to import all of its processed food even a few years ago, but the local industry now produces those, which is good news for the country, she said. “If we want to ensure food security for all, we need to enhance production of non-crop food like animal protein along with good crops,” said Md Eunusur Rahman, agriculture secretary. The goal is to first become self-sufficient, and then explore export options, by making production safe and sustainable, he added. The per capita protein consumption needs to be increased to ensure a healthy nation, said Ajoy Kumar Roy, director general of Department of Livestock. As poultry is the main supplier of protein for most developing nations, it needs to develop further, said EN Silva, president of WPSA. He also said the World Poultry Congress will be held in Beijing next year to help boost the industry, especially in developing nations. The government should provide tax benefits and other financial support to the struggling local poultry industry, said Rahman, president of WPSA-BB. A total of 297 stalls from 147 local and foreign companies have been set up at the show, which will end tomorrow. Some 47 technical papers will be presented at the seminar.